Sydney has a new winner when it comes to the prime time breakfast radio slot on the big commercial FM networks. While Macquarie Radio Network’s talkback show 2GB always takes the overall breakfast spot, the coveted next position has long been held by ARN's infamous morning duo Kyle and Jackie on, in Kiis 106.5. However, not this time, as the pair have been dethroned by rivals at WSFM breakfast. In one of advertisers' favourite booking segments, survey five saw Kyle and Jackie O lose 1.7 percentage points in breakfast, dropping to a 9.3% share. WSFM's Brendan ‘Jonesy’ Jones and Amanda Keller earned a 10.3% share. Kyle and Jackie O started the year with a 10% share in survey one, scooped a stellar 12.3% share in survey two, an 11.9% share in survey three and an 11% share in survey four. The last time Kyle & Jackie O weren’t outright number one in FM breakfast was in survey six 2017 when they were equal number one with WSFM’s Jonesy & Amanda. The last time they were numner two in FM breakfast Show was in survey six, 2015. While the new 9.3% is the lowest in some time, it's a great win for WSFM – also owned by ARN. Also in breakfast, Southern Cross Austereo's (SCA) 2DayFM breakfast trio of with Em, Grant & Ed suffered a drop of from a growing 4.3% share last survey to a 3.3% share now. The station had been on the up. Across Sydney's drive time spot Nova's 96.9's Kate, Tim & Marty smashed the ratings with an impressive 2.5 percentage point increase, giving them a 12.2 % share. WSFM trailed with a healthy 9.9% share with rival Smooth FM taking a 9.5% share. Kiis Network's national show featuring Melbournian “rising stars” ‘Will & Woody’, aka Will McMahon and Woody Whitelaw, dropped from 8.7% to a 7.4% share. Hughesy & Kate, in their still rather new 2Day FM drive slot earned a 6.5% share, down from 7.4% in survey four. In overall listeners across Sydney, Macquarie Radio Network’s talkback show 2GB again pulled in the most listeners, with a sturdy 14.1% share of Sydneysider ears. In second spot for total listeners was ARN's WSFM with an 11.3% share, followed by Nova's Smooth FM which took a 9.6% share - representing a 1.2 percentage point rise. Looking at the digital radio scene in Sydney, ABC Jazz led the pack with 108,000 listeners, followed by ARN's Edge Digital channel, which has been going for four years, and earned 94,000 listeners. Coles Radio came in at third spot with 83,000 fans. In the fifth radio ratings of the year across the Melbourne market, 3AW remained number one with a 13.2% audience share, despite dropping by a further 0.6 percentage points since the previous survey. In the FM battle, Nova's Smooth FM 91.5 took out the second spot for total audience share, reaching 10.4% and growing by 1.3 percentage points. SCA's 101.9 Fox FM came in a close third with an audience share of 10%, falling by 0.4 percentage points. It was followed by ARN's Gold 104.3, which fell out of the top commercial spot, dipping by 0.9 percentage points, reaching an audience share of 9.9%. 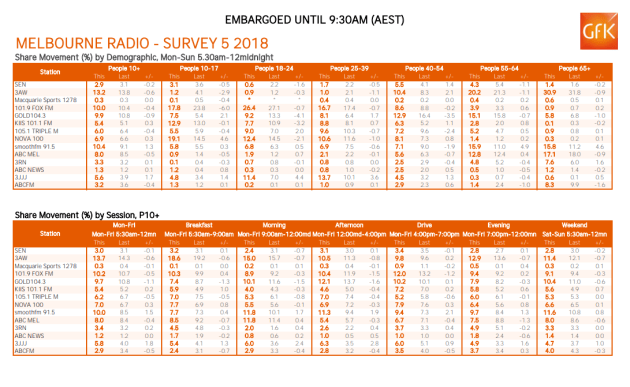 3AW won the commercial radio breakfast slot battle, despite a small drop off from the previous survey, losing another 0.6 percentage points, with an audience share of 18.6%. SCA's Fox FM breakfast show trio of Fifi, Fev and Bryon held firm in second position, with its audience share growing once again, this time by 0.3 percentage points, taking their audience share to 10.3%. Mike Perso and Jennifer Hansen on Smooth FM's More Music Breakfast Show came in equal third with Nova 100's Chrissie, Sam and Browny show, who both increased by 0.4 and 0.8 percentage points respectively, each taking a 7.7% audience share. ARN's Gold 104.3 breakfast show, featuring new host, UK radio personality Chris O'Connell, came in fourth, dropping off by 1.3 percentage points and falling to a 7.4% audience share. Triple M's Hot Breakfast Show with Eddie McGuire slipped to fifth position, down 0.5 percentage points, garnering an audience share of 7.0%. KIIS came in behind Triple M, with a 5.9% share, despite its audience share going up by 1.0 percentage point. In the drive slot, Fox FM's drive show teams, Carrie & Tommy followed by Hughesy and Kate held strong in the top spot once again with a 12.0% audience share, despite dropping off once again in audience share, this time by 1.2 percentage points. Gold 104.3's Gavin Miller came in second growing his show's audience share by 0.1 percentage points from the last survey, now with a 10.2% share. 3AW came in third behind Gold, taking an audience share of 9.8%, recovering by 0.2 percentage points from last survey. In fourth place was Smooth FM, with drive host Byron Webb getting a 2.1 percentage point boost in popularity, taking a 9.4% audience share. Nova 100's Kate, Tim & Marty slipped to fifth place, despite growing its audience by 0.3 percentage points, with a share of 7.9% of Melbournes drive time audience. KIIS trailed in sixth place, with a 7.2% share, gaining 0.2 points, followed Triple M with a 5.2% share. The latest round of ratings was also the fifth inclusion of digital radio ratings for Melbourne. In total people, Double J had the highest audience, reaching a total audience of 74,000, growing its listeners by 21,000. Coles Radio came in second once again with 65,000, up 1000 listeners since last ratings. In third place was OldSkool Hits with 62,000 listeners, growing its audience by 14,000. The next radio ratings are due out on 4 October. Today marks the fifth radio ratings of 2018, including digital radio ratings, with results representing 27 May to 30 June and 15 July to 18 August 2018. 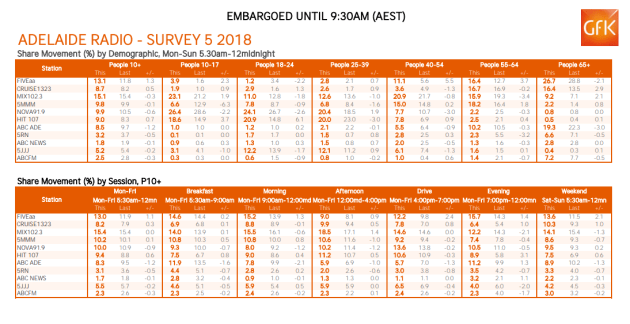 In the fifth of eight radio ratings surveys for the year, the charts below (click to expand) show ratings across Sydney, Melbourne, Brisbane, Adelaide and Perth.